Why is the H.E.C. a revolution in clutches? Where standard clutches rely on facing thickness to determine pressure plate and diaphragm positions, what if there was an alternative solution that virtually eliminates friction material wear? Now there is: Valeo High Efficiency Clutch! Valeo’s High Efficiency Clutch (H.E.C.) is a reliable and cost-effective replacement for original clutch kits with self-adjusting function. Easy to fit: Valeo H.E.C. is installed just like a standard clutch and doesn’t require any additional tools or training. Reduced fitting times: the H.E.C. is fitted just like conventional clutches but take on average 30 minutes less time to fit. No additional operations or checks are required. Comfortable: constant and optimum pedal effort during the entire clutch life thanks to Valeo’s high-quality, low-wear friction material. Reliable: simple and robust design without complex or fragile components. Improved clutch life: Valeo high-quality and low-wear friction technology increases clutch life and heat resistance. Also, improved diaphragm technology allows constant bearing load and helps stops slide along the pressure plate towards the flywheel. Cost effective: reduced fitting time and improved clutch life mean greater savings for everyone. Clamp load is the load exerted by the diaphragm to clamp the disc between the pressure plate and the flywheel. The facing material prevents pressure plate displacement and keeps the clamp load almost constant. The following graph shows H.E.C. clamp loads for new and used clutches. The clamp load is constant over the lifetime of the clutch to ensure effective torque transfer. 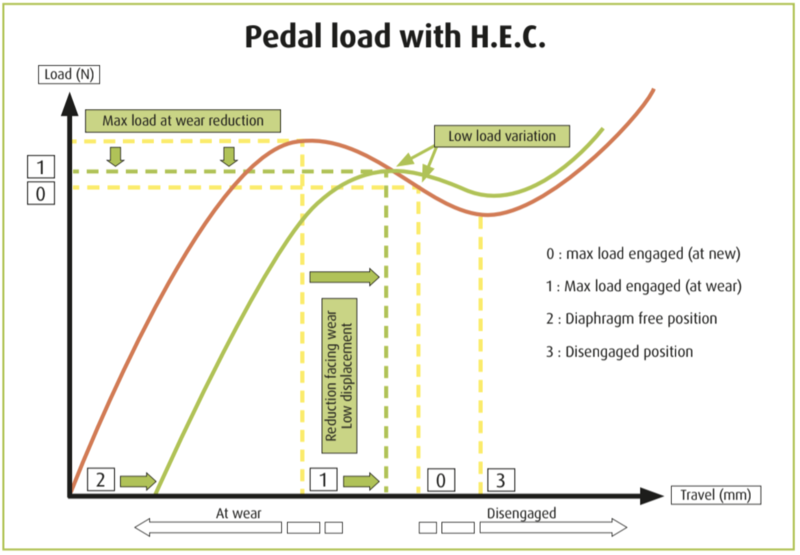 With this clamp performance and the ease with which Valeo’s H.E.C. can be fitted, it’s no wonder more and more workshops are choosing H.E.C. as their go-to replacement clutch kit. And with over 198 references currently available, there’s bound to be clutch solution for you. For more information, see the dedicated Valeo H.E.C. brochure here.